I absolutely love spring! The warm afternoons, chirping birds, longer daylight, and putting away winter clothes! There is something about the change from winter to spring that makes me want to tear apart my house and purge Spring Cleaning! Every year this time I get this wild bug and feel like I must get rid of STUFF! It’s amazing how much one family can accumulate over time. I usually start with clothes as I pull out the Rubbermaid boxes full of shorts, dresses and short sleeved shirts. With three daughters, it’s nice to know that I can get a lot of use out of their clothes as they get handed down year after year. At this age, they are still excited to get to wear their older sister’s clothes; I know that one day that will change. After we sort through last year’s clothes, I like to go through shoes, and then I can get into stuffed animals, toys, books and more. Don’t stop me now! By this point, the kids are usually on to me. They get nervous any time they see something in a pile that may seem out of the ordinary. It’s funny how some things forgotten and overlooked can suddenly become a prized possession once it’s headed out the door. I recently listed my oldest daughter’s bike for sale. She never rides it, and in fact refuses to each time I suggest it. She insists she does not like it. She’s got a scooter and seems to favor that. Once I got a buyer for her bike, I warned her that someone was coming to look at and possibly purchase her bike. She was immediately brought to tears, and promised that she would ride her bike every day if I just did not sell it. Luckily, the buyer found it amusing once I told her the story and cancelled the sale. I’ve gone through about half the house and I think I’ve got a bigger mess than what I started with, even with things going out the door. It’s strange how that can happen. Freecylce: It’s an email group sorted by city. I find my local one, sign up and give stuff away – all free! Friends: I have lots of friends with kiddos around the same age as mine. If I’ve got good stuff I know they’ll enjoy, I love to pass things along. I have a good friend who through her church donates things to an orphanage; I give lots to her. And my newest favorite way to get rid of things is by selling on Facebook Garage Sale sites. Menifee Exchange is one of my go-to places. It’s even better than Craigslist. Menifee Exchange (you can search for it on Facebook) is a group where you can post a photo of what you are selling, a short description including condition and price, and within minutes you will have several people who want to purchase your items. It’s wonderful, and easy. In a few weeks, I’ll have purged quite a bit. It feels good; it feels like spring. It feels like a time for new beginnings. Michelle Walsh is a Menifee resident, a wife and mother of three young girls. 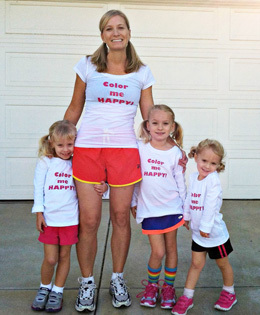 She is a former teacher who enjoys running, exercise, sewing, gardening and socializing. Each week, she shares her experiences as a Menifee mom. Michelle welcomes your comments here. Always enjoy reading your article, Michelle!! It was so nice to bump into you today Joan!! A few people have asked: How to find MENIFEE EXCHANGE: http://www.facebook.com/groups/137815333021395/ From your computer *not mobile phone* click on the link above. Then request to join the group. Once you've been accepted, read the group rules and sell away!